Just a few short years ago, most people were counting down the days until they can get their hands on a pair of Google Glass. They kept counting and counting. Today, no one is counting, because there is no Google Glass. In fact, despite the overwhelming initial support, there are very few actual smart glasses manufacturers today. In 2012 celebrities were out front testing Google Glass, but today, there were only a couple of smart glasses manufacturers at CES. These companies, who are still searching for the answers on what consumers want from their smart glasses, have learned from the failed Google and Intel products. Less is more. The main problem with products like Google Glass was that the invasion of privacy was all too honest. Sure, Google can track everything that you say, buy, and do online, but providing a camera on a pair of perpetually-turned-on glasses was a step too far, for everyone. There was a time when smart glasses were going to be a true replacement for the smartphone. Today, the leading technologies that would run a useful pair of smart glasses haven’t been perfected. 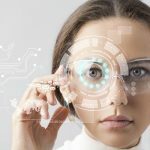 Augmented reality, although growing, hasn’t gained enough traction to become the powerful technology necessary to facilitate the need for a technology like smart glasses. I know what you’re thinking: “virtual reality is available today”. That much is true, but people have been talking about virtual reality for the better part of the past 40 years. Most technologies that were developed, not theorized, but produced in the 1980s have come and gone by now. Think about the VHS or the audio cassette, where are they now? So while virtual reality lingers around as computing systems and image capture improves, the practical applications of VR are severely limited. You know what technology has taken off? The Internet. At Compudata, we provide a lot of useful and educational IT articles at our blog. Visit us today at www.compudata.ca.